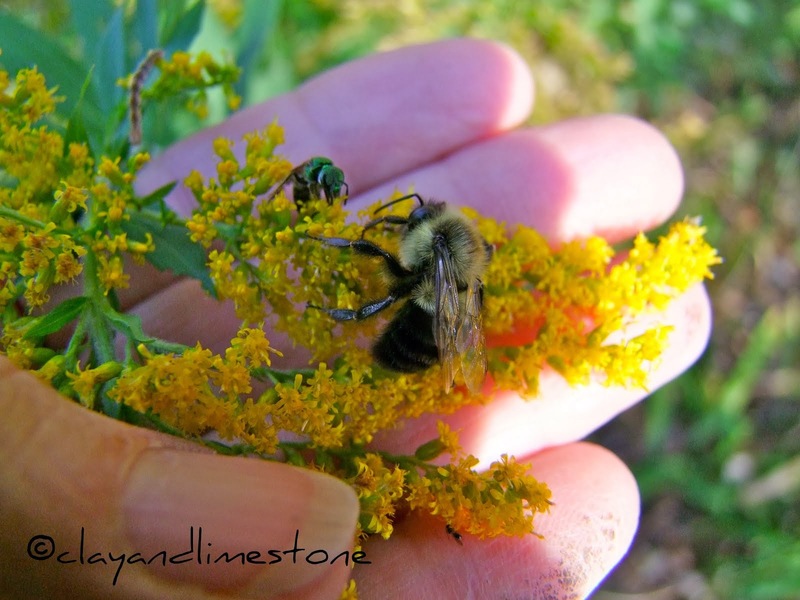 clay and limestone: Pollinator of the Day: Bumble on Joe! Pollinator of the Day: Bumble on Joe! I love the Joes, but then what's not to love with those big beautiful mauve/lavender-pink flower heads that bloom all summer and attract almost every kind of pollinator that visits the garden. If you want the full story on the Joes that live at Clay and Limestone go here...Perhaps, you'll find yourself thinking as I do, "So many Joe-Pyes and not nearly enough garden space." I love Joe Pye Weed, I only have 'Little Joe,' which stays fairly short. I'd love to get the very tall species to make a really big dramatic statement, but it's impossible to find in nurseries. The bees sure do love it. I can send you seeds Alison! Joe doesn't get many bumbles here. They attract the smallers bees and flies. So good to hear you are feeling better. So very glad you're on the mend my sweet friend. Love the face of your bumble in this photo. Joe is seriously one of my favorite plants ever...I can't imaging not growing it...and neither can all the bees! My Joe isn't as attractive as most I've seen, but I do have a new 'Little Joe' that promises to outdo him. Lots of bumbles here, too! Glad to hear you're on the mend, Gail. I am so glad you are mending Gail. Joe is spectacular in my garden. He has spread everywhere and it is a glorious sight to behold. 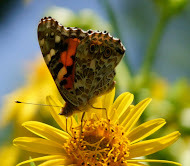 The pollinators and butterflies love Joe too! I so wish I could grow Joe Pye Weed! It apparently doesn't like coastal southern California. But my bees currently seem happy with the heavy bloom on my thyme. Joe Pye weed grows wild around here. We have a lot of it. I have my joes growing in too much shade but there's no where else to put them so we've reached a compromise. I cut down as many tree branches as possible and keep them well watered, and they'll lean for the sun and do their best. It's not perfect but it works and I'm ok with that. The joes, however, may have a different opinion. Gorgeous photo...Joe Pye weed is certainly a favorite, I have a lot of lavender in the garden. What a great picture! And so happy that you're bumbling along on mending, too. Now now, Miss Gail. I thought you were not to be using your thumbs. How are you posting? Well, you'll be happy to hear that I have planted my first Joe Pye this year. Aren't you proud of me?